Hello and welcome to the unofficial web pages of the unofficial movement to turn the house of Aaron Burr into a museum. This movement was started by the West Village Historical Society, another unofficial group of history buffs based in Greenwich Village. We’re a group of 12 guys and galls who love history and who want to see their local landmark, the old townhouse of Aaron Burr, turned into house museum. We are slowly working towards achieving that goal, and we hope to use this website to get our message across. We realize that the proposal that we are interested in might not be that important to most people. Chances of it actually becoming a reality are pretty slim, but we are still going to give it a go. We don’t really have anything to lose. 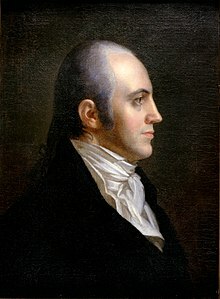 People not caring is actually made even worse by the fact that Aaron Burr isn’t exactly the most popular figures American history. He did after all kill one of the Founding Fathers of our nation. Still, history is history and we hope that you are part of the minority that will show support for our effort. That’s about it for us, thank you for coming to our website and we hope you join our cause. Cheerio.